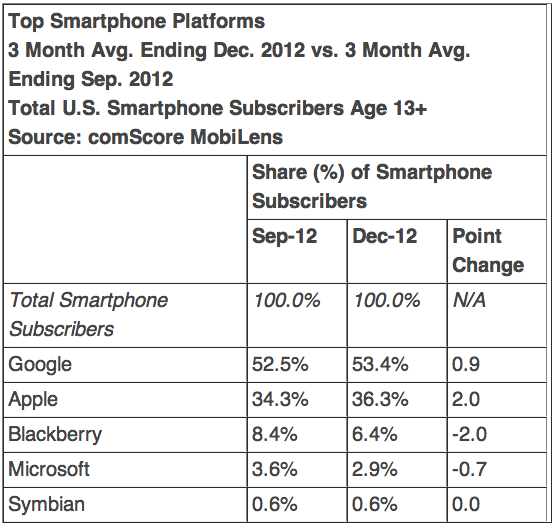 According to the latest comScore MobiLens report for the three month period ending in December 2012, Apple has remained the top U.S. smartphone maker while Android remains the top smartphone platform. Apple ranked as the top OEM with 36.3 percent (up 2%) of smartphone subscribers in the U.S. (which stands at 125.9 million), up 2 percent since the previous MobiLens report in September 2012. 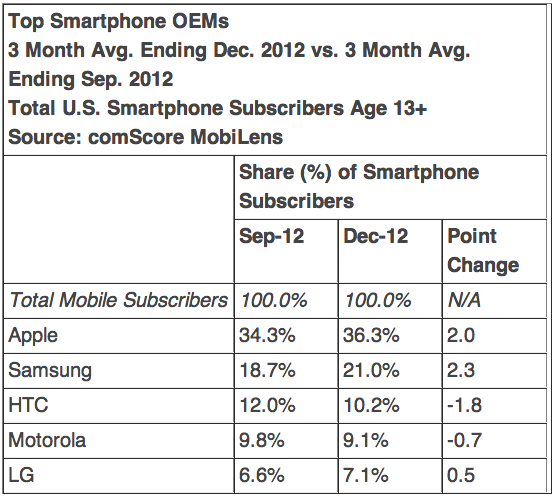 Samsung was in second place with 21 percent (up 2.3%), followed by HTC, Motorola and LG. Both Samsung and Apple continue to dominate the smartphone market as they continued to grow while competitors saw decreases. When it comes to smartphone platform marketshare, Google’s Android OS continues to dominate with 53.4% while Apple follows in second place with 36.3%, followed by BlackBerry with 6.4%, then Microsoft and Symbian. The growth of iOS more than doubled that of Android in the three month period. Earlier in January, comScore released numbers for the overall US mobile marketshare which revealed Samsung was the top cellphone maker (think of all those cheap dumb phones) with 26.9% of mobile subscribers and Apple in second place at 18.5%, based purely on the iPhone.